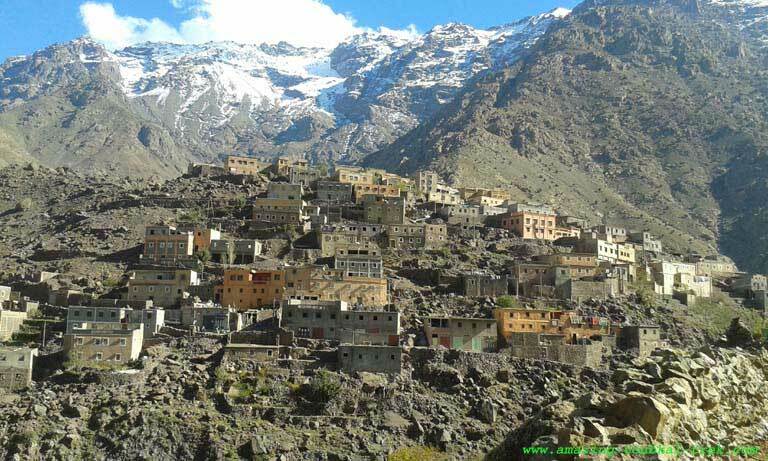 Hike around Berber villages: 5-day trekking through Berber villages and three valleys of the great Atlas Mountain. The route will take you through several Berber villages, stunning mountain passes, and green valleys. You’ll get the chance to explore the most beautiful places in the Atlas mountain and visit a lot of Berber Villages. On the morning of the first day, we will depart from Marrakech heading south through the Moulay Brahim gorge, and wind our way through the upper valleys until we reach our first stop at the higher foothills of the western part of the High Atlas Mountains. ; then will be the trailhead of Imi Oughlad (1,450m peak), Jbel Toubkal (highest peak in North Africa 4,167m), Aglzim (3,650m), and Aksoual (3,847m). After breakfast, we begin on our way, hiking along the Assif N’Ait Oussaden valley, taking us through the walnuts groves. We will reach the 1,995m peak of Tizi n’Taghrhourte and pass through a very rare, flat stretch of land before arriving at Assaka spring. We will have a picnic while enjoying the delightful silence. In the afternoon, the hike will take us down along the rim of the forest; then we will reach a Berber village called D’knt at just 1,870m or Agouns n Assoul. Overnight in a bivouac or gite. On this morning we will be starting with a 3-hour hike through more walnut tree groves, fields of corn and barley, and encounter many herders with sheep and goats. On our way to Tizi n’Tagdalte, we will make our way down along the juniper trees until we hit one of the springs among the trees – this will be our picnic spot for the day. After we continue walking to the village of Tizi Oussem (1,850m) then to Tamsoult where we will set up camp for the night or stay in the Refuge. This day consists of a short adventure to the waterfall at Azib Tamsoulte, then return so we can cross the Tizi N’Mzzik pass (2,500m). 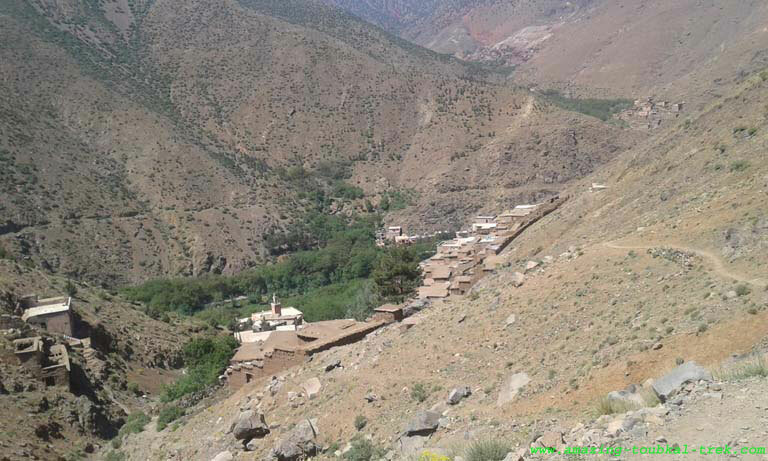 Here we will join the main Toubkal valley at Imlil (1,900m) for lunch and spend the night in a guest house. We begin on our 6-7 hour trek through Berber hamlets and head through 2 mountain passes. The route that we will be taking is circular so that we can take in as much beauty and scenery as possible. 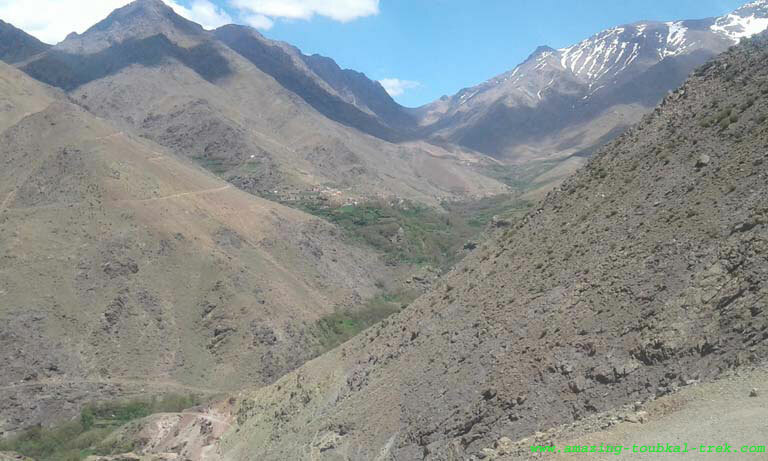 The trek starts off with us heading east from Imlil (1,740m), along with the side of the Tamatert valley, before eventually heading north through the pass of Tizi n’Tamatert (2,279m), and into the Imenane after passing the Berber village of Tinerhourhine. From here we follow the valley north again through the mule’s trails that wind through almond, walnut, and apple groves until we arrive at Ikiss. The next leg of the journey takes up through the mule trails to Tizi n’Aguerssioual pass (1,767m), then into the village of Aguerssioual. After lunch, drive back to Marrakech. End of the hike around Berber villages. 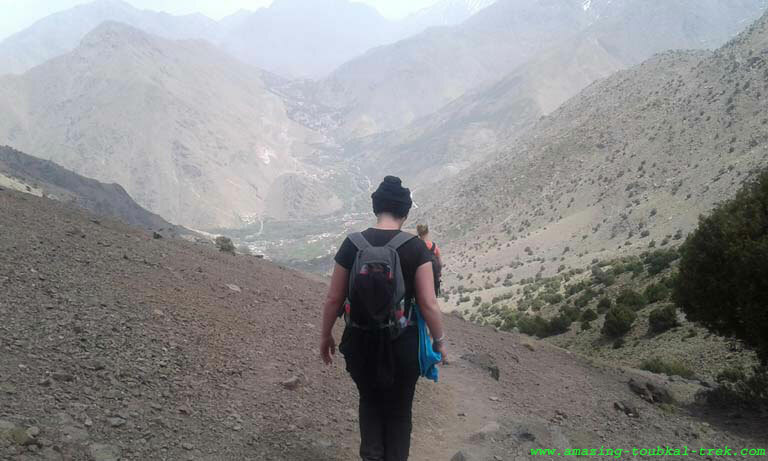 During hike around Berber villages, you will visit old villages as well as crossing valleys in the Atlas mountains. Trek Around Berber Villages, Trekking Through Berber Villages.